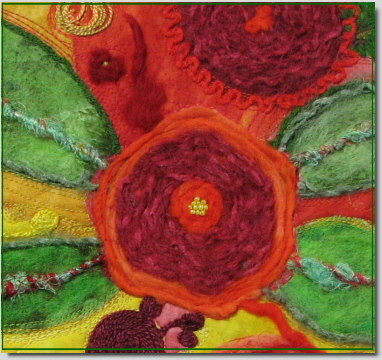 When I was working on the Encased project, I felted several of the floral rounds in assorted colors. Here’s another little project using these versatile flower shapes. First, you will need to felt a floral round in any color you like. Cut it out of the organza and match it up with some colorful rick rack. Turn your floral round to the back side, and dab some fabric glue around the edges. Position the rick rack so that the rounded points form the look of petals. Your flower/flowers should look something like this when you are finished. To create leaves, fold some green rick rack at a point as shown. Now wrap the rick rack back and forth around itself. The inner loops will lock together. Trim off at the length you would like your leaves. Cut a piece of fabric whatever size you would like you project to be. The size will depend upon what you are making. Stabilize it with a heavy fusible stabilizer or interfacing. Alternately, you could sandwich it with batting and quilt it. Cut a piece of the colorful rick rack to form a stem. Dab it in a few places on the back side with some fabric glue, and position it on the front of your project. Dab the raw edges of the leaves with fabric glue and position the ends under the rick rack. Secure the outer edges of the leaves with beads. Embellish the rick rack stem with seed beads at each point. Position your flower at the top of the stem. Secure it will a little fabric glue in the center back to keep it from shifting. Embellish the petal points with bugle beads. 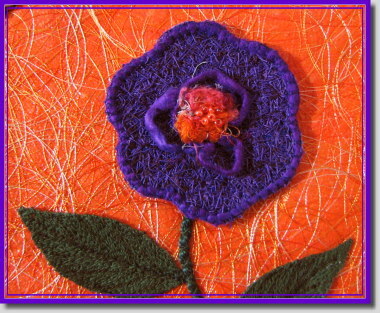 I’m sure you’ll find all sorts of creative ways to embellish these little felted flower. Have fun! Sometimes I order fabric online. Occasionally, it’s not what I had hoped for so it becomes a makeover candidate. This floral print came with a grainy looking surface that I disliked. I thought it might be nice to trap some snippets on the surface. When considering what kind of fusible to use to accomplish this, I decided to experiment with Stitch Witchery. First, I cut a piece the same size as the floral background fabric. I then painted it with Liquitex Medium Viscosity paint, mixing burnt sienna and green for the dark green area. I used magenta for the corner. While the paint was drying, I placed painted (Lumiere Pearl Magenta) Cariff .50 stabilizer snippets on the surface, creating a heavier concentration in one corner. I then placed the painted Stitch Witchy square over the fabric and snippets, covered it with parchment paper, and pressed the layers for about 10 seconds on a wool setting. Owing to the web-like quality of the Stitch Witchery, the resulting surface retained some of the background while allowing the snippets to shine through without being totally subdued. However, the original floral was now completely transformed. Next, I set up my sewing machine for free motion quilting and threaded the needle with Valdani 35 wt. Green Grass cotton thread. After stabilizing the fabric with thin cotton batting and backing, I stitched the green surface with a free form leaf design. For the magenta area, I used Valdani 35 wt. Hawaiian Orchid cotton thread and stitched a meandering design. In part two, I’ll share how I created the flowers. For those of you experimenting with the colorform shapes, I’ve uploaded another file (fjpaisley.dst) to the Fem-Gratis box for you to download. I saved my favorite leaf for last. After free motion stitching a center vein, I worked three loops of outline stitches. I then appliquéd the leaf down with a feather stitch. I think the feather stitch creates a really nice edge finish for the wool pieces. The final section of the circular design consisted of a center bud motif, two petals, and two leaves. Using a dark gold embroidery thread and a decorative seed stitch, I worked a diagonal crosshatch pattern on the surface of the yellow bud, something often seen in crewel work. I then finished the edge by couching yellow perle cotton with a blanket stitch. Next, I positioned the red petals in place and secured them with a decorative triple-circle stitch down the center. The edges were appliquéd in two stages. First, I worked a reverse blanket stitch in a matching embroidery thread. 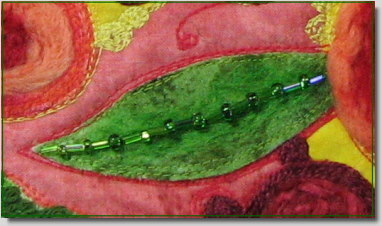 I then switched to a green embroidery thread and couched lime green perle cotton next to the previous round of stitches. The third and final step of the motif was the leaves. After free motion stitching some veins down the center of each leaf, I raised the feed dogs and couched green perle cotton around the edges. 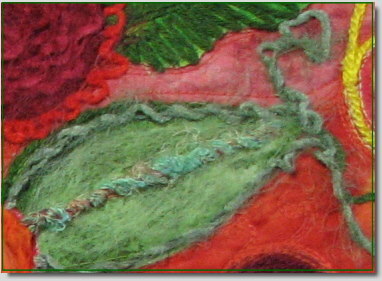 I added a simple scroll design below the bird, which I free motion stitched with dark green embroidery thread. As the final embellishment, I beaded the bud motif between the crosshatching. I also added beads to several of the leaves and the scroll below the bird. This particular design will eventually become a pillow, but I’m sure I’ll be using the same technique to embellish other items with these fun-to-make felted wool appliqués. To define the bird’s wing area, I chose a scallop stitch, which I stitched across the center of the wing and satin stitches to define the lower feathers. I then satin stitched around the entire wing with a matching gold embroidery thread. To give the bird’s neck a little more detail, I chose a decorative stitch. The three yellow petals were created the same way as the tail feathers. First, I attached them with a free motion straight stitch. Next, I finished the edges with a blanket stitch using yellow embroidery thread. Red perle cotton was couched under the stitching. The red and yellow contrast so beautifully with each other in this little motif. I think a full-petaled flower in the same colors would make a wonderful embellishment for another project. Each of the leaves received individual detailing. For the first leaf, I stitched some veins and then gave it a trailing vine. The edges were appliquéd with a decorative stitch. Using a dark green embroidery thread, I gave the second leaf a center vein and then thread painted a stem base. A lime green perle cotton was then couched down with a dark green blanket stitch around the leaf’s edge and stem. The third leaf was detailed in gold, beginning with a decorative stitch center vein and an outer border of couched gold perle cotton. For a little more contrast, dark green perle cotton was couched with gold embroidery thread next to the previous couching. In part four, this project will receive the finishing touches. As a base for the felted pieces, I choose 100% linen, which I stabilized with a piece of starched craft felt. I attached the craft felt to the linen with a light spray of 505 temporary adhesive. If you have an embroidery machine, you may have noticed that many commercial digitizing companies use felt as a base for their samples. Felt gives the stitches plenty of substance to wrap around. Several years ago, I experimented with felt as a stabilizer for dense embroidery designs and found that if I starched and ironed it (which makes it thin and crisp), it worked beautifully as a cutaway stabilizer. Next, I used a standard size dinner plate and chalk marker to draw a circle on the linen. The circle would later serve as a placement guide for the flower and leaf shapes. After locating center placement for the bird, I began stitching the tail feathers with orange cotton embroidery thread. First, I free motion stitched each feather in place. I then changed to an open toe foot, raised the feed dogs, chose a blanket stitch on my sewing machine at a 2.8 mm width, and couched a #5 yellow perle cotton around the edges of the tail feathers. Next, I positioned the body of the bird and blanket stitched around his head. I then changed to a dark gold embroidery thread and used a triangular shaped satin stitch to form the bird’s beak. Using the same color thread, I finished the edges of the bird’s body with a perle cotton-filled satin stitch. In part three, my little bird will get his wings, and I’ll begin filling the chalk circle with some flora. Seventeenth-century “fiber artist” used their creative imaginations, wool yarn, and linen to produce wildly popular crewel work designs. Colonial woman carried on the tradition in the eighteenth century. Crewel work continues to have a following today and even shows up in its high tech form via computer digitized embroidery. I’ve always been drawn to the design elements: the fanciful leaves, flowers, and fauna. The hand thread painting with its beautiful shading gives us much to emulate in our own work. Although original crewel work used a twisted 2-ply wool yarn, I decided to needle punch some wool roving shapes and see where they led me. I also choose to needle punch on air rather than using a stabilizer. Usually, I have a definite design plan in mind before I begin a project, but that was not the case with Old is New. First, I pulled a little wool roving and formed it into a lightweight ball by repeatedly pulling the fibers and then compacting them. 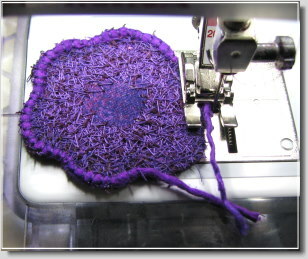 Next, I needle punched the ball with the Babylock Embellisher, beginning in the center and then manipulating the fibers into a desired shape. I found a bamboo stick to be quite helpful in the shaping stage. Here I am forming some yellow petals. Here is one of the leaves being shaped and felted. Here is the bird’s head area being formed. This is the beginning of the bird’s wing, starting in the center and then working outward. As the pieces slowly accumulated, I positioned them around an imaginary circle until I was happy with the basic design setting. In part two, I’ll continue sharing how the project evolved. Angel Petals is a three-layered flower consisting of a felted wool center sandwiched between two layers of Angelina. To create the Angelina layers, pull some fibers from a mix of Angelina “Hot Fix” colors, and place them on a piece of parchment paper or a Teflon pressing sheet. I used Raspberry Sparkle, Cotton Candy, Sugar Plum, and Violette Crystalina. Pull enough fiber to create two flower layers. Better results are usually obtained when colors are mixed well. Place a piece of parchment paper on top of your mixture and press at a “silk” setting for about 3-4 seconds. Let cool and then check to see if all the fibers bonded. You should have a nice piece of flat iridescent fabric. Attach the Angelina layers to the top and bottom of your flower center with a tiny dab of fabric glue placed strategically at the outer area of the flower centers. 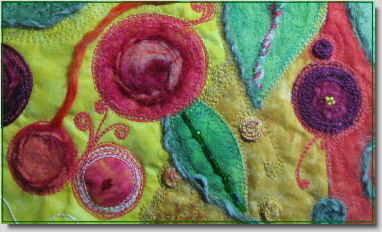 Offset their position so that the petals fall between the felted flower petals. Just a slight touch of glue will do the job since the edges of the cut Angelina will naturally want to adhere to the felted wool. 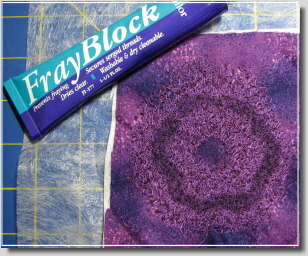 Also, you will be felting the center of the flower, so keep the glue clear of this area. Next, cut a small circle of craft felt for the flower backing. Attach it to the back of your flower using the method above. Just a touch of glue will do the job since this piece will be secured by the felted center. For the fluffy center, cut six short strands of yarn in a contrasting color. I used a yellow boucle. Any yarn that can be pulled apart should work well. Position two strands in the center of your flower front, forming an “X” shape. Lightly felt them in place with you needle punch machine, keeping the flower stationary and only felting the very center. Now take two more strands of yarn and wrap them with a coordinating color of Angelina. A few twists should do the job. Place them in an offset position on top of the previous felted strands of yarn and needle punch them in place. Use the last two strands of yarn to fill inany open areas. Check the back of your flower to make sure the yarn has felted through to the back. Using your fingers, pull the yarn strands apart until they fluff up and fill the center. You can cut the strands to any length you desire. To complete your flower, sew a brooch pin on the back, using a strong polyester thread. I like to place a little glue on the pin before sewing so that it stays in place. You now have a beautiful little flower to give as a gift or to embellish your summer wardrobe. Embellishment Village now offers a new crimped “Hot Fix” Angelina in twenty colors. The individual fibers are finely cut and wavy. Their website states that the crimped Angelina has a softer texture when bonded and drapes nicely. Additionally, the colors are more intense, adding a little more glitz to your projects. I’m not so sure Angelina really needed more glitz, but someone must have thought more is better at EV. I received a shipment a few weeks ago and have been excited about using the new product in a project. I believe I ordered all twenty colors! To make the Angelina felted flower, you will need a few colors of roving (mine drank the Kool-Aid), a few colors of Angelina (regular or crimped), and some yellow yarn, such as boucle. 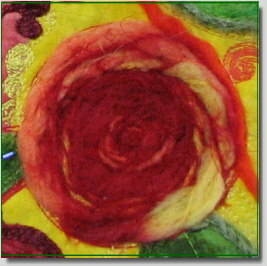 Pull out a small amount of roving with which to fill in your felted flower. Mix in some Angelina strands, using pulling and folding motions until you have a well mixed ball. 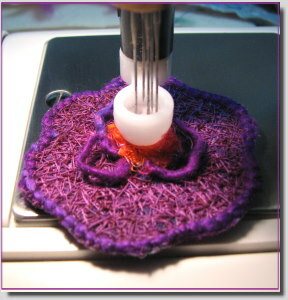 Shape the roving mixture to fit within the outline as you needle felt it with your Babylock Embellisher or other needle punch machine. When you complete the first color, pull roving and Angelina in a second color, mix it as described above, and felt it around the inner part of the petals to add more visual interest. Cut your flower out with a sharp pair of craft scissors, removing the outline as your cut. In part two, we’ll create the Angelina petals and fluffy center. The technique that follows is my favorite parts of this project. Adding fluff to the center of the flowers is both easy and quite versatile. First, mark the center of your organza covered flowers with a chalk marker. Choose a yarn that will fluff, such as a boucle for the next step. Cut five short strands of the yarn. 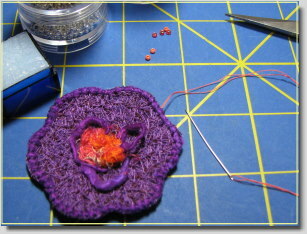 Place two strands of the yarn in the center of one flower, making an “X” shape. 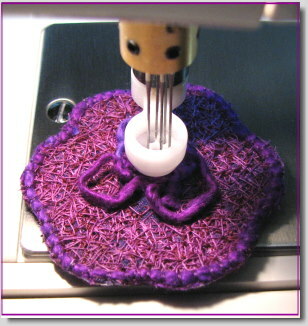 Using your Babylock Embellisher or needle punch machine, tack the yarn down in the very center. Don’t over do it; just secure the yarns. Now place the three remaining strands of yarn over the previous strands, filling in the bare areas. Needle punch them in place securely. Check the back of your work to make sure the fibers have come through sufficiently. Separate the fibers with your fingers until they fluff out nicely. You can give them a haircut if you would like or leave them bushy. You might like to play with this method and take note of the different effects you get when altering the length of the yarn fibers. For the stems, I used the bottom of a large thread spool to mark curved areas around my flowers. 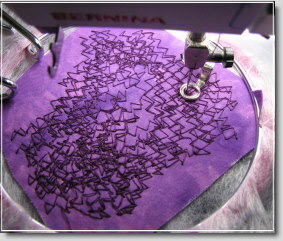 I then choose a stitch on my machine that has the appearance of couching (#157 on the Bernina Aurora 440). You can use any stitch you like to accomplish the same thing. Simply follow you markings and then end the stitching with a few securing stitches. To add a little embellishment to the stems, thread a needle with a strong sewing thread and sew a bead at each end. Another project complete! The little fluffy flowers work well on quilts, decorator pillows, handbags, totes, hats, and other items that are conducive to 3D embellishments. This project includes several embellishing techniques that are fun to play with. You will need a background fabric, two colors of organza, green perle cotton, beads, and yarn. First, apply a fusible stabilizer to the back of your fabric. I used Decor Bond. Draw seven circles on the stabilizer in a pattern similar to the above graphic. You can place the motif in the center as I did mine or change the setting to one that you like better. Take one of your organza colors and cut out some large circle shapes. Make sure they are quite a bit larger than your drawn circles since the felting process will pull the organza towards the needles. Working from the back side of your fabric, place an organza circle on top of a drawn circle and slowly needle punch the organza in a circular motion . Hold the edges of the organza as you work so that it doesn’t bunch up. Repeat this process for each circle. When you’re finished, you should have seven fuzzy circles on the front of your fabric. To make the stem, cut four long pieces of green perle cotton (or any other fiber you like) and tie them in the center with some thread. Now double them over so that you have eight strands. Attach a cording foot or open toe foot to your sewing machine and thread the needle with an embroidery thread. Set your machine on a zig zag stitch at about 5.0 mm stitch width. Position your strands of perle cotton under the foot, holding the tied thread in one hand behind the needle. Zig zag stitch the entire length of cording. You may like to stitch the cord several times, using several shades of green thread. When you are happy with the look of your cord, place it in the center of your fuzzy circles. You may like to tack it down with a light touch of fabric glue. Next, couch it with a matching thread, attaching beads as you sew. In part two, I’ll show you how to make the fluffy little flowers. The technique for creating the flower can be used for individual items or for large areas of thread work, such as thread painting landscapes. For the flower, choose two shades of embroidery thread any color you like, and place one in the needle and the other in the bobbin. I used cotton embroidery thread. Next, stabilize a piece of base fabric and secure it in an embroidery hoop. Choose a closed free motion foot so that the thread work does not get caught while you’re working. Drop your feed dogs and work a zig zag stitch over all the surface. I set the width at 3.5, but experiment and see what width you like best. Move rather quickly, allowing the stitches to build up on each other. When the surface is almost covered in stitches, tighten the top tension until the bobbin thread shows on top. Work around the surface. When you’ve covered an area large enough for your flower, dab the circumference with some Fray Block or a similar product before cutting. Once dry, cut out your flower shape. Remove the free motion foot and attach an open toe foot. 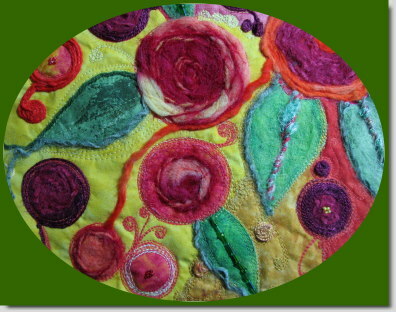 Using silk roving or yarn, couch a decorative edge around your flower with a zig zag or buttonhole stitch. 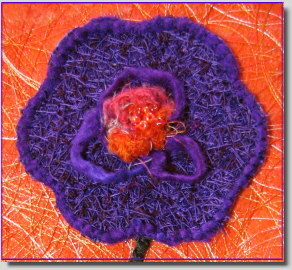 Take another piece of silk roving or yarn and shape a center for your flower. 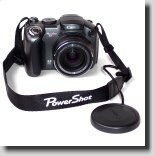 Attach it with your Babylock Embellisher or needle punch machine. 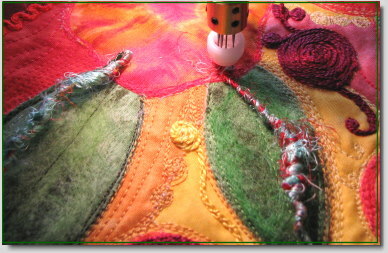 Next, take a little orange or yellow roving and needle punch it in the center of your flower. For the final embellishment, sew a cluster of beads in the center. Your flower is complete. In part six, we will thread paint some leaves, make a cord on our sewing machines for the stem, and complete the project. With the heavy thread work behind us, we now turn to filling some of our flowers with felted or couched yarns, adding some yarn to a few of our leaves and to our background, and capping it all off with beads or French knots. Take a look at your work and decide which flowers you would like to embellish with yarns. For visual interest, select several different colors and audition them until you find just the right ones for your project. I used spun roving, chenille/eyelash mixes, and brushed yarns. Beginning with any flower other than the center, needle felt as much or as little yarn as you like within its center area. On the flowers that I completely filled, I began by tacking down the end of my yarn in the center and then slowly working in a spiral motion until the yarn reached the edges. You don’t need many stabs of the needles to do this. The goal is to secure your yarns but not to completely felt them with the background. On other flowers, needle felt smaller amount of yarn and leave some of your flower background showing. On still others, mix your yarns so that the flower is multicolored. Before working the center flower, needle felt some spun roving (or other fiber) in a radiating design out from the edges. If your center flower has leaves, needle felt or couch a special decorative fiber down the center vein. I used wrapped silk cords. Then fill your flower with various yarns. With a contrasting color, needle felt a colorful center. Now take some green furry yarn and felt or couch it along the edges of your leaves just as you did with the heavy thread in part four, working past the leaf tip and meandering here and there. Look at your work and see whether there are areas that need to be filled. For the look of tiny flower buds, I took small pieces of roving, twisted them into a tight little ball, and needle felted them in place. I also meandered spun roving and needle felted it in place. For the final embellishment, do some bead work down the center vein of a leaf or two, at the center of some of your flowers, and any place else you would like some bling. As an alternative or an additional embellishment, work some French knots in the center of flowers. Congratulations! Your garden is now complete. I hope you loved doing this project as much as I did.